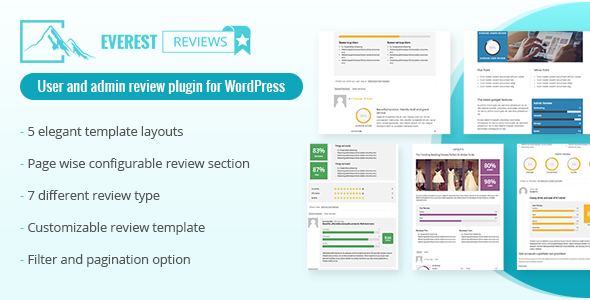 Everest Review is the simple utility plugin with multiple features for you to display reviews for your posts, pages, and various custom post types faster and simpler.. This Plugin allows you to insert your review inside your posts or pages. You can also take review from the site visitor and display with many other multiple customization option to change to fit the layout of the site along with responsive design. Create unlimited review template! Create and assign template to multiple page for multiple actions through elegant and useful setting in the plugin. Select from 5 beautiful pre-designed layout and 5 different review form layout along with multiple review display design option for your own review theme. Everest Review is very handy to makes your website’s accessibility higher with more user engagement than ever before. Add review power to your website, get Everest Review now! – 5 different beautiful and sleek template for admin and user review design to choose from. – 5 different template for review form to choose from. – unlimited number of review in your site. There is no limit in the number of reviews, review form you can use in your site. – define each individual review section such as admin review section, user review section and user review form in either order or display either one.for particular page, just select a reviews, review form for your page or leave one work for all through single setting. – Mobile ready menu template designs. Responsive and touch friendly to support user review from smaller devices too. You can define to review to be displayed either above or below the content and you can also define shortcode to display in either position around the page/post content. – You also can upload your own custom image icon. – Or you can also set custom icon if the icon you are looking for is not available in icon set using custom input field. – You can sort the order easily for the review form in the plugin while creating/editing the to custom order along with ability to design the custom options to custom design the form layout. You don’t have to be expert or know the code to work with the template using and integrating it into the site. – You can filter the user reviews and paginate the user reviews as you wish with simple ajax load more just by manipulating few setting in backend. -You can choose among 7 different review types.